I was inspired by the 3DS, I'm really looking forward to Paper Mario 3DS. Here we have: Bowser in his Koopa Kopter, Kooper, Lady Bow chasing a Goomba, Parakarry carrying Mario, Princess Peach and Kammy Koopa.... in 3D! can i ask how you made this and does it work with the 3D function of the 3DS? and yes it does work on the 3DS, there's a special version linked. The 3D effect is nice but, do I need an actual 3D glasses to see the full effect? 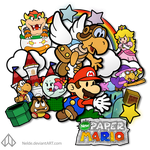 You will still continue its project of new paper mario? And if the answer is yes, when will be ready? I hope I can do something in 3D again soon. Same here, your 3D work is the best I have seen. Yeah, there's a new one coming out. I hope this year! Dude, In in the HECK did you do this???? Are you also looking forward to the new Paper Mario game for the 3DS? ..but you made my day! Haha, glad to hear that. Not used to seeing in 4D. Yes but in 2D gaming you can see in 3D kinda and with 3D gaming you can see in 4D.